Holiday.gr - Platis gialos, a trip to a myth! 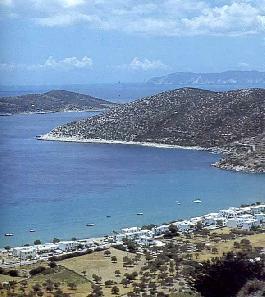 The beach of Platis Gialos is the most cosmopolitan beach of the island. It is in the south part of the island, 12km from Apollonia. It’s the most beautiful beach in Sifnos and one of the biggest of Cyclades islands. It is in the safe arms of a cove and never has etesian winds. Around the beautiful beach is the homonym settlement. Here you will find many hotels and rooms to let. After your bath you can eat in taverns along the shore fresh fish, roasts and traditional dishes. In the region you will see a lot of vineyards and olive groves. There are many pottery workshops. Visit them and take information for the secrets of this art. Don’t miss buying beautiful ceramic designs. Platis Gialos has big archaeological interest. In the northeastern part of the beach are the remains of the White Tower. It is the most known from the 57ancient towers in the island. In the south part, in location Akrotiri excavations brought into light a prehistoric cemetery. In the north part of the beach, on the top of the hill is built the monastery of Panagia Vounou dated from 1813. The view from up there is magic. Been to Platis gialos ? Share your experiences!